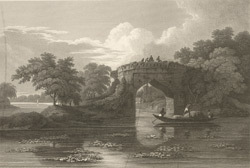 This etching is taken from plate 20 of Charles D'Oyly's 'Antiquities of Dacca'. The Tantee (or Weaver's) Bridge was situated in the weavers' quarter, and crossed a nullah, or watercourse. James Atkinson wrote: "The navigation of the nulla is now so much impeded by the numerous aquatic weeds of this luxuriant climate, that even the smaller craft pass along it with difficulty." This area of Dhaka was also known for its boat-building and carpentry industries.